The Minnesota Timberwolves are learning to close in tight games. The 3-3 Wolves have won by margins of three points, two points and three points so far this season, the 14th time in NBA history that a team has won their first three or more games by three or fewer points. 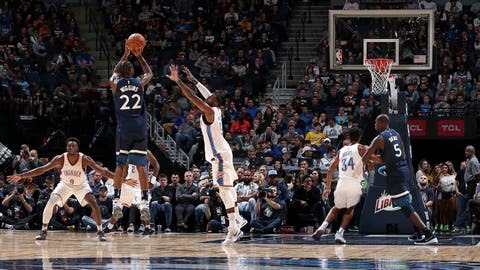 From the defensive side — their 100-97 victory over Ricky Rubio and the visiting Utah Jazz — to Andrew Wiggins’ game-winning 3-pointer in their first win over the Oklahoma City Thunder, the Wolves are finding ways to win in close games. For what it’s worth, the only teams to reach four such games — the 1992-93 Los Angeles Lakers and the 1978-79 New Jersey Nets — both made the playoffs. And while the presence of star newcomer Jimmy Butler has been game-changing for the Wolves — Butler has missed two games this season, and both ended in major losses — Wiggins and Karl-Anthony Towns have been piling up points. Since Towns’ rookie season, he and Wiggins are among the highest-scoring active duos in the NBA. They’re averaging nearly 44 points per game combined, a figure that trails only Steph Curry and Klay Thompson of the Golden State Warriors, Damian Lillard and C.J. McCollum of the Portland Trail Blazers and DeMar DeRozan and Kyle Lowry of the Toronto Raptors.